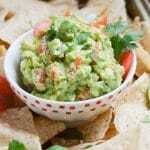 Home » Side Dish » The Best Easy Guacamole Recipe! 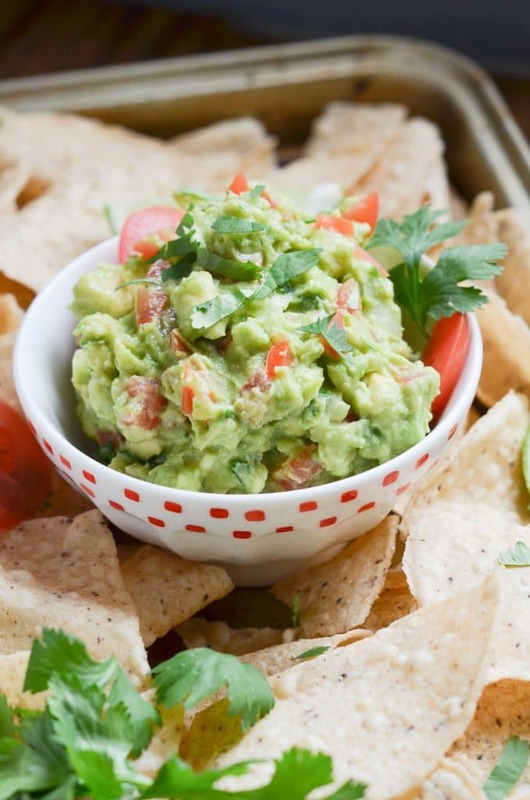 You’ll love this easy guacamole recipe that uses healthy fresh ingredients. And, it only takes minutes to prepare. 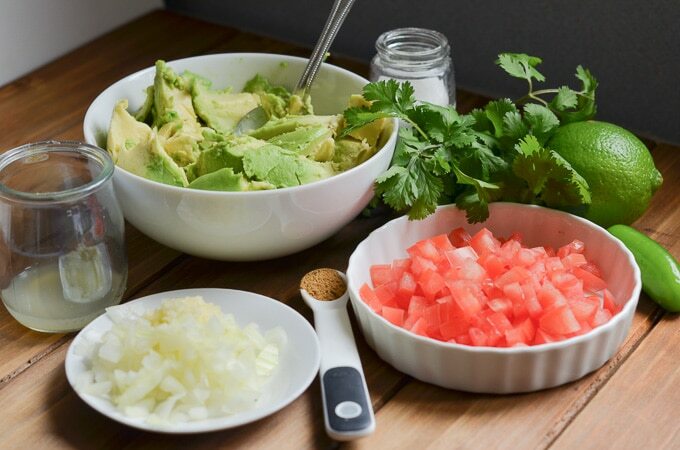 Plus, I have the best tips for making ahead and storing freshly made guacamole! Step 1 – Gather and measure the ingredients. Tip: look for avocados that are ripe and firm. If the avocado feels soft and mushy, pass on it. With a knife, slice the avocado and open so you have two halves. Take out the pit and scoop out the green avocado “meat”. Add other ingredients and it’s ready. 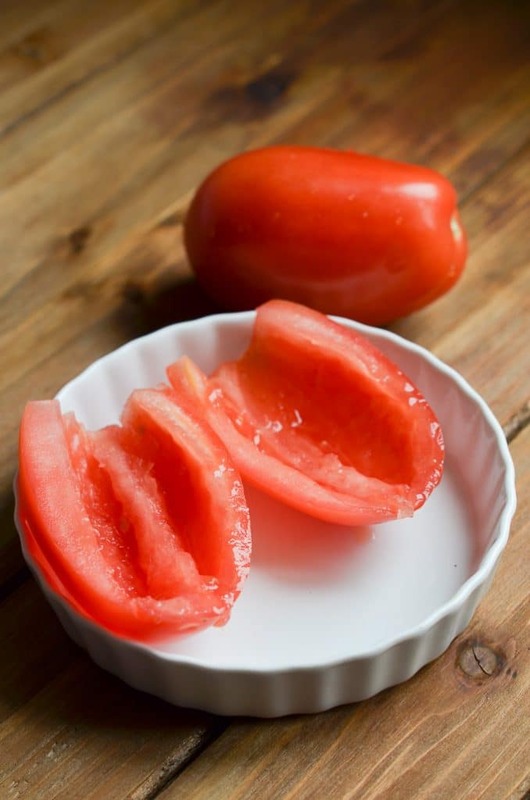 To cut the tomato in half, remove the seeds, and you’ll end up with tomato as shown below. Dice the tomato into small pieces. Step 2 – Add the ingredients to a mixing bowl. Stir to combine all the ingredients well with a spoon. Taste and adjust seasonings (e.g. add more salt, garlic, etc…). Use a potato masher to make avocados as chunky or creamy as desired (even better than a fork, which can leave the mash too chunky). 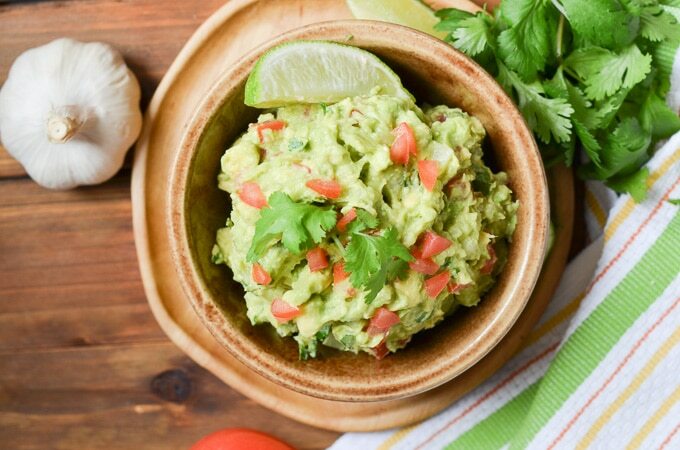 Adding a little extra lime can help keep guacamole green. Do not use a food processor to “mash” avocados as it will make them too pureed. Oxidation happens when the avocado flesh is exposed to air. To save the guacamole for later, lightly press plastic wrap over the surface and store in the refrigerator, for up to a few hours. Guacamole tastes best at room temperature. Buy avocados that are firm and leave on the counter a few days to ripen. To quickly ripen an avocado, try this microwaving tip. The green avocados tend to be less ripe than the black ones in my grocery store. Another trick to get them to ripen quicker is to place in a sealed paper bag with a banana for a day or two. If too ripe and you are not ready to use, place the avocado on the refrigerator shelf which will slow ripening. If you need your avocados ripe sooner, wrap the avocado in aluminum foil and place in 175 degrees F. oven for about 10-12 minutes. Let cool and avocados should be ready to use. There are so many variations possible with guacamole too. This version is my basic, simple, everyday guacamole recipe. I can whip this up in minutes and can be eaten right away or saved for later by storing in the refrigerator. The secret to keeping guacamole green is to store in an airtight sealed container. This is a great one for guacamole. 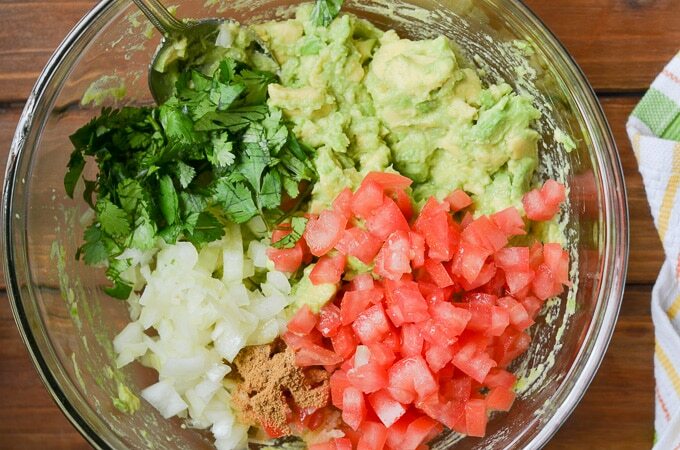 Put the guacamole in a container, fill to the top, and place the lid on. The lid should be touching the guacamole and there should be no air at all in the container (and no room for any more guacamole). 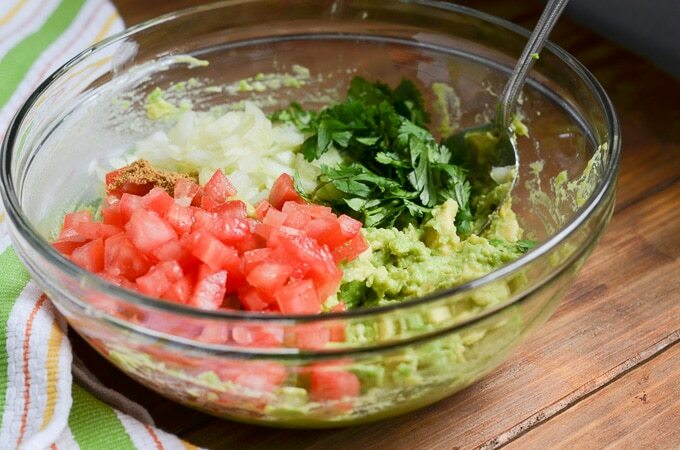 Another tip to keeping guacamole green is to place the guacamole in an airtight container, and pat down the guacamole, place about 1/2 inch of water on top of the guacamole and place lid on top. I have not tested this method yet. With any Mexican inspired cuisine. As a replacement for mayonnaise on a sandwich. p.s. I love to see what your making! Post a photo and tag me on Instagram@24carrotkitchen! 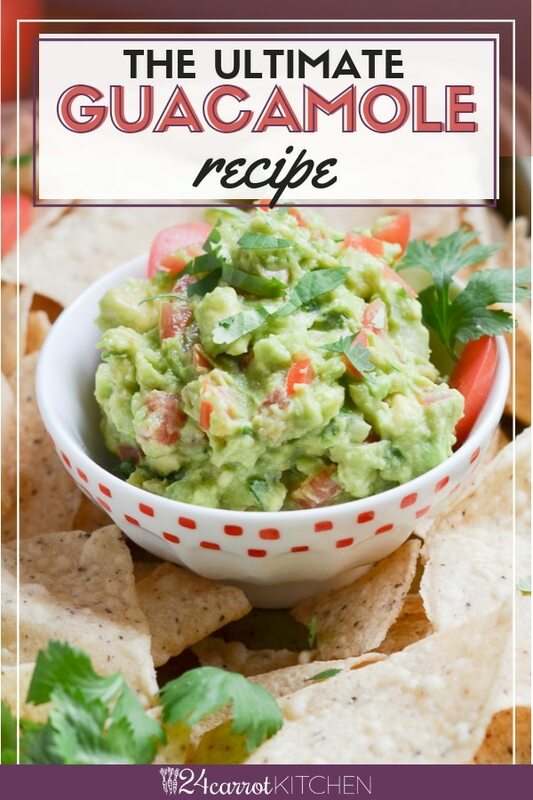 Easy Guacamole Recipe You Will Love - So Easy! Place the avocado flesh in a bowl and mash until desired texture. I like mine a little chunky. Best consumed right away, but can put in refrigerator for later use. May add several dashes of hot red pepper sauce to taste. Do not use a food processor to "mash" avocados as it will make them too pureed. The secret to keeping guacamole green is to store in an airtight sealed container. I have linked below a good one to try. Put the guacamole in a container, fill to the top, and place the lid on. The lid should be touching the guacamole and there should be no air at all in the container (and no room for any more guacamole). Update Notes: This post was originally published on November 17, 2014, but was republished with an updated recipe, new photos, step by step instructions and photos, success tips and a video in February 2019. Thank you for using my affiliate links, which at no extra cost to you, provides me with a small commission that helps with the running of this site. I look forward to creating and posting many more delicious recipes for you. Subscribe To Newsletter & Receive Week of Smoothies Printable! Subscribe to our newsletter which includes the latest recipes, tips and more! Previous Post: « The BEST Waldorf Chicken Salad (Paleo, Whole30)! Guac is definitely one of those love it or hate it foods, and I LOVE IT! I’m pretty certain the only people who hate it are the ones who’ve never tried it 😉 Looks tasty! Thanks Kelly. I agree and couldn’t live without it now.